My Simon Says Stamp February 2016 Card Kit arrived yesterday and I jumped right into making some cards with it. After stamping the image repeatedly with Memento Tuxedo Black Dye Ink, I coloured each row in with a different shade of red Copic Marker. (I was inspired by the Crate Paper Hello Love Stickers that came in this month's kit). I die cut the panel using the rectangle from Simon's Bundle of Stitches Dies and adhered it to a notecard made from Simon's Cotton Candy Cardstock. I then white heat embossed the sentiment on a strip of Simon's Black Cardstock and adhered it to the card. I love it. That was a lot of stamping, but well worth it. Great card. what a great way to use one little image! Some day I am going to bite the bullet and get some copics. Really cute card! Great card! This looks like another wonderful kit. I LOVE this idea! And I love the contrast of the black with white embossing...Great job! Wow, what a great card. You take stamping to a new level. I absolutely love that sentiment....the font on it is so cool. That's a lot of stamping! WOW, and it looks fantastic! The Misti is an incredible tool! I love the ombre effect you've made here - it's beautiful! I've never had a Simon kit but have always wanted one, just not in the budget. One day I will have one! Yep I think I need a MISTI after seeing your fabulous card, and the card kit too! This looks like one of the best yet! 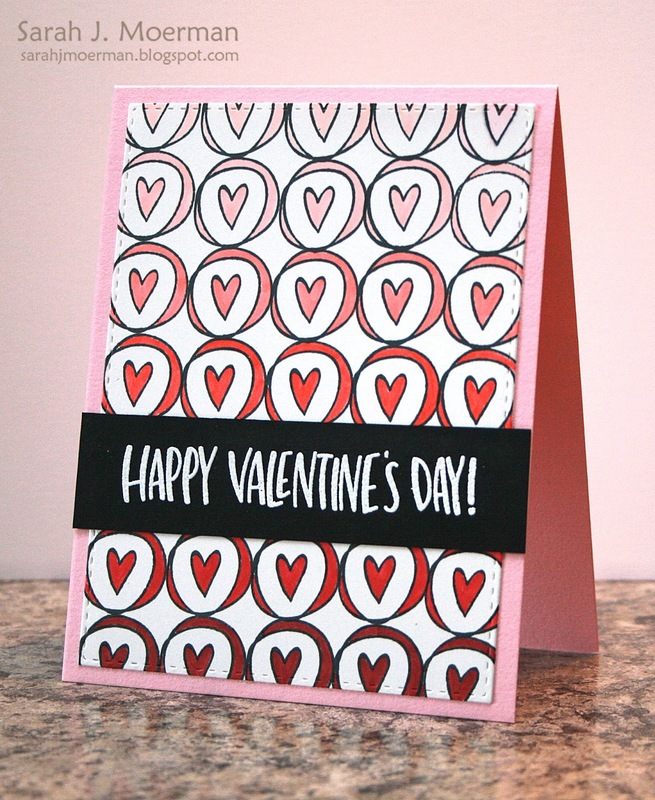 Beautiful card, I love the repeat stamping. Such a great card kit!! I love the ombre hearts paired with black so striking! I love the kit as it can be used for so many occassions. Love the background you created. Great card! Sarah I love how you make entire backgrounds from a single stamp. You are so talented and inspiring! I like this card a lot. I never would have guessed that you stamped the background, I was looking for the patterned paper. Super cute. I just got a MISTI tool for Christmas and I am having so much fun with it. I love the way you stamped those hearts on the card, another idea to try. Wow, perfect stamping and colouring. It looks like patterned paper! Wow, the background on your card is amazing. The card kit also looks amazing. Thanks for sharing. Beautiful card, the paper looks absolutely beautiful! Very pretty card and kit! Awesome card! Love the gradient color scheme! I think I'm gonna have to buy a Misti. Your design is so cute &would be a real job without one. Sarah, I looked at that and thought it was patterned paper from the kit! Yes, You're that good. I'm really wanting a Misti tool, but I just ordered a bunch of tools. Maybe next time. Love seeing what you're creating! Thanks, Paulette S.
i love what you created with this set Sarah. Love the ombre. Love it. This is amazing! Wonderful card! Beautiful card and love this kit!!! Wow I cannot believe you stamped that gorgoesu ombre background! And YES MISTI is awesome tool ever inented! I love the background you created on this card. Oh so much fun in one little box! Your card is so sweet, Sarah! I look forward to this time every month with fingers crossed. Really like what you did with one little stamp! Wonderful! Such a striking design with that stamp image, lovely card!!! This is a wonderful kit! They keep getting better and better! What a pretty card! Totally love the new kit! Oh, I love this card! Gorgeous! Love your card. I think I may use it as inspiration for a Valentine's card for my husband, although I'm not sure how I'll go without a MISTI. What a pretty card. Love the ombre look of the coloured images. You make the prettiest cards, Sarah. Love this kit! Man! I wished I had the Misti. It looks like a great tool to have. This new stamp set in this kit looks wonderful. Your card looks delightful! 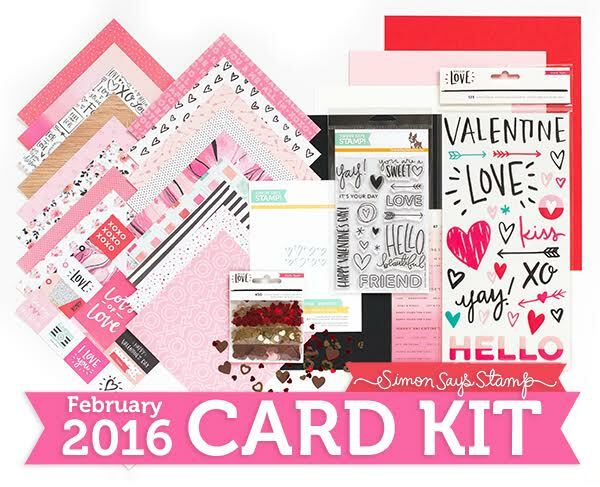 This new valentine's day kit is perfect! This new card kit looks awesome! This is incredible, I thought it was patterned paper!!!! !